Summary: CCC will carry out the “Tour de Turtles Educational Program” as an endeavor to increase awareness about the complex migratory movements of Florida sea turtles and the myriad threats affecting them here and while they are abroad. Through the Tour de Turtles online educational program, CCC is putting a fun new twist on its popular Sea Turtle Migration-Tracking Education Program by conducting a mock race between tracked turtles to see which ones can complete the turtle version of a marathon (26.2 hundred kilometers). Website visitors can download a free Educator's Guide that provides background information about sea turtles and tips on how to integrate the program into lesson plans. Visitors can also download classroom activities targeted to different education levels; interact with sea turtle characters in a turtle game; take quizzes; plot migration data; watch educational videos and animations about threats to sea turtles; and complete other educational activities. Results: CCC has completed all of the project tasks. The Educator’s Guide to spotlight Florida’s sea turtles was completed by the 6-month report. CCC also developed educational Flash Presentations and new online activities for the 2009 Tour de Turtles. The program was promoted to registered educators, schools and educational associations. 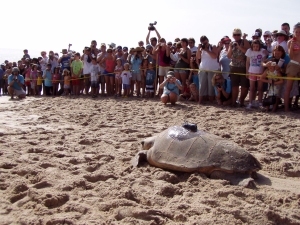 The 2009 Tour de Turtles featured live turtle releases from the Archie Carr Refuge in Florida. A total of six loggerheads were released from the Archie Carr Refuge, four by UCF (under a project funded by the Sea Turtle Grants Program) and two by CCC/UCF (funded by sponsorships obtained by CCC). The two released by CCC/UCF were both live releases, attended by an estimated 1,500 people. The Tour de Turtles was promoted via the CCC website, a Twitter account, CCC’s Facebook and other Social Media pages. Videos and photos related to the live releases was posted within the Community Section of the Tour de Turtles website. Visitation between July 24 to November 16, 2009, for www.tourdeturtles.org includes 32,650 total visitors representing 125 countries, 27,837 visitors from the United States, and 9,454 visitors from Florida. The website received 234,216 page views, with visitors staying an average of 5 minutes 1 sec. on the website. The Community Section of the website included over 19,000 page views, with nearly 6,000 people using the TurtlePlayer game, and over 5,000 total views of the posted videos.